iPhone – UIActionSheet Example | Eureka! UIActionSheet is a cool way to get user input. The following example shows you how to implement the UIActionSheet. 1. Extend the UIActionSheetDelegate in the .h header file of the ViewController and add the (IBAction)showActionSheet:(id)sender method. 3. Link the (IBAction)showActionSheet:(id)sender with a Hello Button in the main view such that the UIActionSheet will appear when user presses the Hello Button. thanks for this! I am wondering if you need to put this in a View Controller or if you can implement this in the app delegate. I am trying to choose a way to notify the user that the network is unavailable (or has become available) and figure that the AppDelegate is the place to a) listen for the notification and b) post the new status from. Any thoughts on this? i haven’t tried to make it in the app delegate. but as u can see in the above example, the view controller needs to implement the UIActionSheetDelegate. so i guess it should not work in the app delegate. i suggest u can put the checking logic in the app delegate as a global method and call it whenever it needs in the view controller. hi, im still new with iphone development, can i have your full source code of this basic app ? cause i need to understand every single function, pleasee..
you can refer to iPhone – Start Developing Your First iPhone Application for a basic Hello World iPhone application. you can show the UIActionSheet instance by the showInView method. Probably you need to add the codes in (void)applicationDidFinishLaunching:(UIApplication *)application if you want to pop up the actionsheet just after the application finishes launching. Great example! Thanks a lot! The only thing I don’t get is how to make the self.label reference work… it doesn’t build cleanly after entering the listed code. I’m pretty new to iOS and I’m sure it’s fairly easy to do, but I have no idea! Thanks for the cool post. Did u create the label thru the interface builder on the controller view? I tried adding a label in the nib file and calling it ‘label’, but nothing was autogenerated in the viewcontroller.h so I’m not sure how the viewcontroller can ever refer to it as a self property. u need to define a UILabel in the controller header file and link the UILabel in the .nib to the controller. if i remember correctly, try the right click on the controller in the .nib and u could link them. I think there is no new window concept in iphone application but you can navigate to another UIView after clicking the button. Do u want to create an application with tabs? You could try the UIWebView. See the tutorial below. Are u using the UITabBarController? if yes, you could take a look on the Apple Class Reference. I didn’t try the TabBarController before, so i am not sure if this is correct or not. hope it could help. Great Post! It’s super quick and easy to implement! can we give text color to the contents of action sheet? there is no official way to customize the button in UIActionSheet. but you could subclass the UIActionSheet and create your own customization. Can you elaborate more about your problem? and see what buttonIndex you get when you clicked the cancel button. Hi! Im super newbie in xcode. Regarding the action sheet, I want all 3 buttons in that action sheet to jump into another view controller or any other controller. How will I call those controllers using the buttons in the action sheet?? Many thanks! you need a UINavigationController. You can take a look on the following example. I am trying to detect whether the user pressed the cancelButton or destructive button on the actionSheet. Depending on his/her input, I would like to modify the alert message shown on the screen. So I tried using if to check the buttonIndex, but it turns out that the buttonIndex value does not change with the input from the user. but, I get wrong results when I have multiple UIAlert at different points on the same screen. 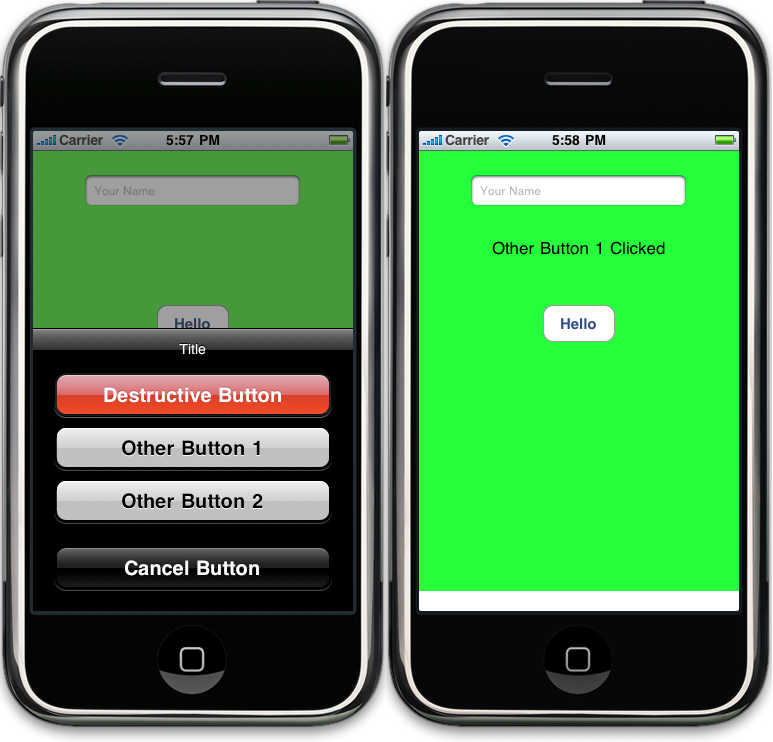 In short, I would like to use a different UIAlert for different actions/inputs from user. Therefore, how do I detect which button on the actioSheet has been pressed by the user? Did you implement the following function? you could check the pressed input button by the buttonIndex. thanks your reply! I did it slightly differently. I will share the code thr github. Sorry that i missed your comment. Anyway, good to know that you have solved the problem. Awesome mate thanks a lot.